Home » Blog » What are 360-Degree Photos and Videos? If you use social media there is a good chance you have seen new types of photos and videos popping up. This content is referred to as 360°(360-degree) photos and video, or spherical content, or high media and has brought about a new form of storytelling for businesses and audiences alike. What are 360-Degree Photos and Video? 360° content is defined by its capability to be viewed in any direction on vertical and horizontal axis 360 degrees by 360 degrees. A key element of this medium is that the viewer can interact with the image or video and look around as they please. This can be done with a mobile device by using its screen as a “window” to the image or video and physically moving it up and down as you look around. It can also be viewed by using a cursor to pull the image or video in any direction to look around. Unlike conventional photos and videos, this allows the viewer to interact with the content and immerse themselves in the given environment. This is different from a 360° panoramas in the sense that a pano can be viewed in any direction on a horizontal axis but not vertically. This is known as a long photo and isn’t considered a true 360° photo. How do 360° photos and videos work? 360° photos and videos are taken using a specially designed 360° cameras that almost always have two or more wide angle lenses. The camera lenses face in opposite directions and allow it to capture its surrounded in all directions. Advances in technology have allowed 360° cameras to pack insane amounts hardware and software into some dauntingly compact camera gear and range in specs and prices. Since this material captures a scene in all directions, it will also capture the person operating the camera. This creates unique and sometimes difficult situations for the creator since the rules of conventional photography and videography don’t always apply. As 360° content becomes more and more powerful for businesses and popular with mainstream users, the platforms we use are creating their own compatibility with the medium. Google Street View allows 360° photos and virtual tours to be uploaded to showcase businesses and places on Google Maps. This gives users important insights on the exact location of a business, as well as what to expect it to look like on the exterior and interior. 360° photos have become a powerful tool for business to showcase their storefronts and properties because of these specific reasons. Facebook allows users to post 360° content on their profiles and even use it for Facebook live. This gives users the opportunity to capture highly immersive experiences for friends to see what they are doing in a creative way. You can even use 360° photos as a cover photo now on your profile! Youtube also has 360° content capabilities. For 360° videos, it allows hi-res interactive content to its users for highly engaging material. Although these are the biggest platforms that offer 360° content compatibility right now, we can rest assured that other social media platforms like Snapchat, Instagram, Twitter, and more are on the way. 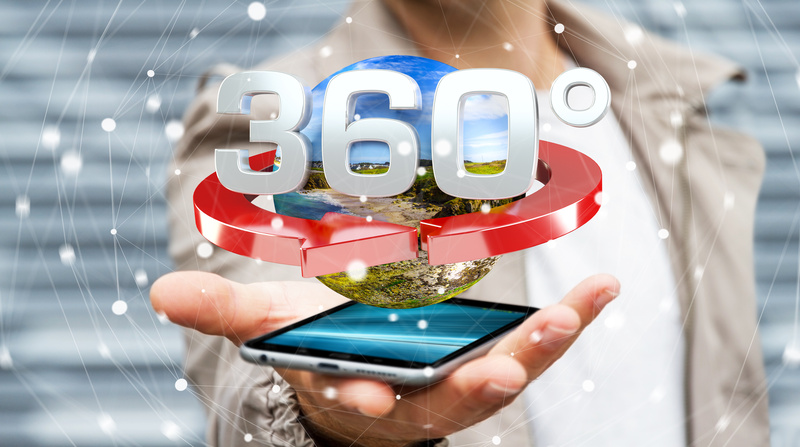 With the recent emergence of new technology and social applications, 360° content is one of the most important things a business can do to engage their audience. The applications of this new type of content are endless and create a new platform for business to showcase their spaces, services, or products. By placing audiences in the center of a well-constructed environment is proven to provoke a strong emotional response that can spark behavioral changes. Using 360° content dramatically increases the chances to make a lasting impression on a potential customer by providing them the opportunity of “actually being there”. Become a business pioneer in this new and exciting type of media and build a 360° photo and video strategy today that will grow your audience engagement. There is no limit to how this type of content can be applied to market a business, space, property, or product. If you are looking to have 360° photos or videos done for your business please contact us to learn more about how we can use this immersive media for you.